This is Part 2 of the Series, "The Origins of World War III"
When these plans were made, Mr. Shevardnadze was seen as an asset by both Western investors and the U.S. government. His reputation as the man who helped end the Cold War gave investors a sense of confidence in the country, and his stated intention to move Georgia out of Russia's orbit and into Western institutions such as the North Atlantic Treaty Organization and the European Union played well at the U.S. State Department. The United States quickly moved to embrace Georgia, opening a military base in the country [in 2001] to give Georgian soldiers "anti-terrorist" training. They were the first U.S. troops to set up in a former Soviet republic. But somewhere along the line, Mr. Shevardnadze reversed course and decided to once more embrace Russia. This summer, Georgia signed a secret 25-year deal to make the Russian energy giant Gazprom its sole supplier of gas. Then it effectively sold the electricity grid to another Russian firm, cutting out AES, the company that the U.S. administration had backed to win the deal. Mr. Shevardnadze attacked AES as "liars and cheats." Both deals dramatically increased Russian influence in Tbilisi. As an article in the Guardian by Jonathan Steele explained, the opposition leader, Viktor Yushchenko, who disputed the election results, “served as prime minister under the outgoing president, Leonid Kuchma, and some of his backers are also linked to the brutal industrial clans who manipulated Ukraine's post-Soviet privatization.” He further explained that election rigging is mainly irrelevant, as “The decision to protest appears to depend mainly on realpolitik and whether the challengers or the incumbent are considered more ‘pro-western’ or ‘pro-market’.” In other words, those who support a neoliberal economic agenda will have the support of the US-NATO, as neoliberalism is their established international economic order and advances their interests in the region. "Throughout the 1980s, in the build-up to 1989's velvet revolutions, a small army of volunteers - and, let's be frank, spies - co-operated to promote what became People Power. A network of interlocking foundations and charities mushroomed to organise the logistics of transferring millions of dollars to dissidents. The money came overwhelmingly from Nato states and covert allies such as "neutral" Sweden. [ ...] The hangover from People Power is shock therapy. Each successive crowd is sold a multimedia vision of Euro-Atlantic prosperity by western-funded "independent" media to get them on the streets. No one dwells on the mass unemployment, rampant insider dealing, growth of organised crime, prostitution and soaring death rates in successful People Power states. Roman Bessmertny, Yushchenko's campaign manager, two years prior to the 2004 elections, “put as many as 150,000 people through training courses, seminars, practical tuition conducted by legal and media specialists. Some attending these courses were members of election committees at local, regional and national level; others were election monitors, who were not only taught what to watch out for but given camcorders to record it on video. More than 10,000 cameras were distributed, with the aim of recording events at every third polling station.” Ultimately, it was an intricately well-planned public relations media-savvy campaign, orchestrated through heavy financing. Hardly the sporadic “people power” notion applied to the “peaceful coup” in the western media. "American money helps finance civil society centers around the country where activists and citizens can meet, receive training, read independent newspapers and even watch CNN or surf the Internet in some. The N.D.I. [National Democratic Institute] alone operates 20 centers that provide news summaries in Russian, Kyrgyz and Uzbek. All of that money and manpower gave the coalescing Kyrgyz opposition financing and moral support in recent years, as well as the infrastructure that allowed it to communicate its ideas to the Kyrgyz people." "... which details how western-backed non-governmental organisations (NGOs) can promote regime and policy change all over the world. 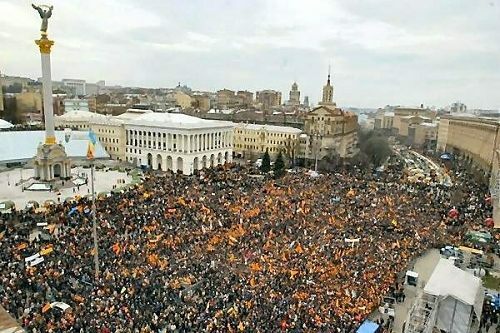 The formulaic repetition of a third "people power" revolution in the former Soviet Union in just over one year - after the similar events in Georgia in November 2003 and in Ukraine last Christmas - means that the post-Soviet space now resembles Central America in the 1970s and 1980s, when a series of US-backed coups consolidated that country's control over the western hemisphere." "Many of the same US government operatives in Latin America have plied their trade in eastern Europe under George Bush, most notably Michael Kozak, former US ambassador to Belarus, who boasted in these pages in 2001 that he was doing in Belarus exactly what he had been doing in Nicaragua: "supporting democracy". "The case of Freedom House is particularly arresting. Chaired by the former CIA director James Woolsey, Freedom House was a major sponsor of the orange revolution in Ukraine. It set up a printing press in Bishkek in November 2003, which prints 60 opposition journals. Although it is described as an "independent" press, the body that officially owns it is chaired by the bellicose Republican senator John McCain, while the former national security adviser Anthony Lake sits on the board. The US also supports opposition radio and TV." "The New World Nazis" have always had a PLAN for WWIII and Now is the time to Start it! and these Bloody Nazis will pull WWIII off: and it is closer than most folks think!